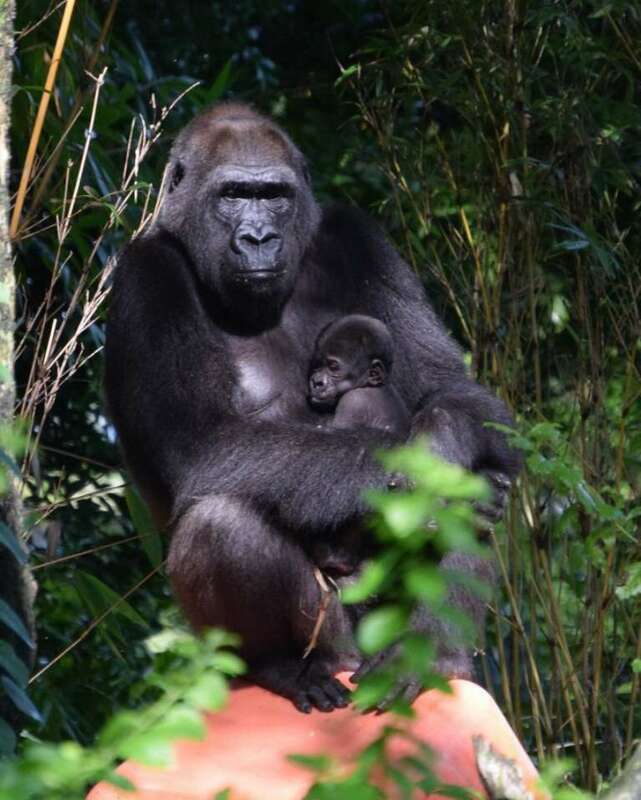 Disney’s Animal Kingdom has announced the second birth of a western lowland gorilla within the past month. The newest of the newborn arrived September 3 to mother Kashata and father Gino. He has not yet been named. Gino is the also the father of the male gorilla born August 7 to mother Azizi. Born Sept. 3, 2014 to mother Kashata and father Gino, the healthy infant joins another male gorilla who was born Aug. 7 to Azizi and Gino. The infants are the fourth and fifth gorillas born at the theme park. The family group includes Benga, an adult female, and a 4-year-old female named Lilly. Disney says Kashata cares for both her newborn and daughter Lilly, and she serves as a role model for new mother Azizi. Gino, known for his dominance and for pounding his fists on his chest, is tender with his two babies. Gorillas are the largest of all primates, standing up to 6 feet tall and weighing up to 450 pounds. The gorillas live on the Pangani Forest Exploration Trail at Disney’s Animal Kingdom. Park guests currently can see the newborns periodically, a Disney spokewoman said. Five gorillas have been born at Animal Kingdom as part of the Association of Zoos and Aquariums’ Species Survival Plan. The first arrived in 1997 before the park opened. Others were born in 1999 and 2010. Disney’s Animal Kingdom also participates in AZA Species Survival Plans for elephants, cotton-top tamarins and okapi. Will you be going to the Animal Kingdom to see the new baby??? Why or why not? Comment below and let me know! !